Broken Sword is back. But is it broken? What is Broken Sword 5 – The Serpent’s Curse? 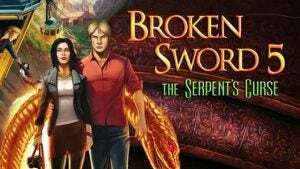 Broken Sword 5 – The Serpent’s Curse is the result of a kickstarter campaign from Revolution software, the studio behind the first two Broken Sword games, and their more recent remakes. Those were two stone cold point ‘n’ click classics, and the idea of this new game is to bring back what made them so popular. The game is split into two parts, and we checked out the first on the iPhone 5S. Its visuals and audio are just about spot-on, but some pacing issues stop this first episode from being as fun as it should be. After the second Broken Sword game, the series went 3D. The painted static backgrounds used in almost every classic point ‘n’ click game were replaced, and long-term fans now tend to agree that the series’s magic was lost in the transition. Broken Sword 5 – The Serpent’s Curse makes a very deliberate attempt to return to the old style. Above everything else, this is a bit of a nostalgia trip. However, it is a good style to return to. Broken Sword 5 uses beautifully drawn backgrounds that – like the old days – are 2D and largely static. Revolution has been careful to take a ‘painterly’ approach, giving them the same look as the old games. Key voice actors return too, and while there is a more-than 16-year gap between this game and Broken Sword II, the characters sound more-or-less exactly the same. It’s an important part of Broken Sword 5’s charm. Not everything is the same, though. The character models are clearly based on 3D models rather than 2D sprites, and look closer to those of more recent adventure games, such as those of the Runaway series. They look a little more stilted as a result. It’s a pity. The sense of being almost, but not quite, a return to the heyday of classic adventure games is true in the game itself too. Broken Sword 5’s story fits in perfectly with the series’s origins. Our lead George Stobbart finds himself once more in Paris, a mysterious crime occurs and he bumbles his way through investigating it as our second lead Nicole Collard sighs with affectionate exasperation in the sidelines. The relationships are the same, the plot familiar and many of the scenes are deliberately near-identical to those of the old Broken Sword games. However, the pacing of this first episode is a real issue. Where its inspirations whisked you off to new countries just before you got too used to your surroundings, the first few hours of Broken Sword 5 Episode One are spent begging for clues on the streets of Paris. And the story doesn’t offer quite enough intrigue in its early stages to stop play from feeling, at times, like a plodding chore. There are interesting characters whose presence lightens things, but not with the density or eccentricity of the best adventure games – and that includes the first two Broken Sword games. This may change with the second episode, and it does feel like the sort of problem that afflicts game-makers trying to return to this classic form. Revolution made the remakes of the old Broken Sword games, but not any brand new ones. Telltale’s earlier graphic adventures suffer from the same sorts of narrative issues. The iPhone edition we played through is also pretty buggy. And some of the actual puzzles are too fiddly on the small screen. It would work better on a larger iPad or Android tablet or even a PC. However, we still recommend fans of the series to check Broken Sword 5 out. The interface works well, and avoids some of the most irritating tendencies of old point ‘n’ click games. As standard, blue halos outline any selectable objects near your finger, and this avoids pixel hunting. Purists can turn it off though. And unlike the many recent graphic adventures, it’s blessedly free of completely ridiculous puzzles you could never work out on your own. Should I buy Broken Sword 5? If you’re not already a Broken Sword fan, we recommend checking out the HD remakes of Broken Sword: Shadow of the Templars and Broken Sword: The Smoking Mirror before downloading this new title. It’s successful in many respects, but the more expert narrative pacing of the previous games make them the ones to check out first. It has the style and some of the charm of the early Broken Sword games, but bugs and pacing issues mean it requires the patience of a fan. The post Broken Sword 5 – The Serpent’s Curse Episode One appeared first on Trusted Reviews.